If you’re in Houston, or in the New Orleans area, you’ve probably got your air conditioner back on. I had jeans on earlier and put shorts on when I got home from Kroger. DUH. It’s our OCD weather. Here in Houston, we’ll have chances of rain and another cooling front next week. Will it freeze? Not according to what I saw, but who knows? Sometimes, not even the National Weather Service does, so we just wait and see. They do their best, but you know the old saying, “Man plans, God laughs.” Mother Nature’s like that, too. If you’re in an area where it’s still freezin’ cold, I’ve got a recipe for you today. Takes a little while, but worth it. Keep reading. VERY delicious, and perfect for cold days. So, did you OD on chocolate for Valentine’s Day? Did you get your honey a little something nice, or make a great meal? (You didn’t get a “payday loan” to get it, did you?) I had some hot chocolate, and yesterday, I finally made some yeast-free brownies . I just wanted some, that’s all. I went to Kroger today and didn’t even bother with my usual Sunday treat, a dark chocolate Mounds candy bar–the coconut pieces drenched in chocolate. Oh, and SOOOOO much red stuff on sale today–candy, stuffed animals, cutesy things, you name it. I saw floral arrangements of every kind with markdown stickers on them. However, I’m not sure why they were trying to sell arrangements with dead flowers in them. Maybe they were just too busy to get rid of them. Unless there’s a market for dead flowers I’m not aware of. Wonder if I can capitalize on it. Nevermind, I already squeezed into a glass of water. So a couple of weeks ago, neighbor K gave me a pack of chicken tenders, that, quite frankly, don’t fit in the freezer. This was my main motivation for wanting to make Chicken Chili from Barefoot Contessa Parties, but also since I hadn’t had it in a long time. And through a series of events, I finally got the stuff made. Last time I made this dish I ended up fobbing some off to both neighbor K and neighbor R, because it made SUCH a huge amount. This time, by default, I halved it. 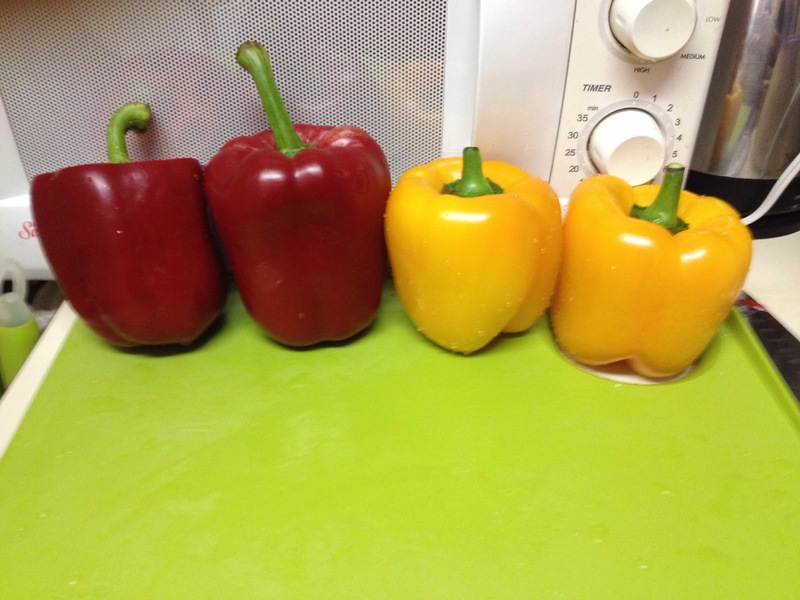 I wrote down TWO of each color of the bell peppers, not four, but bought four cans of the tomatoes. 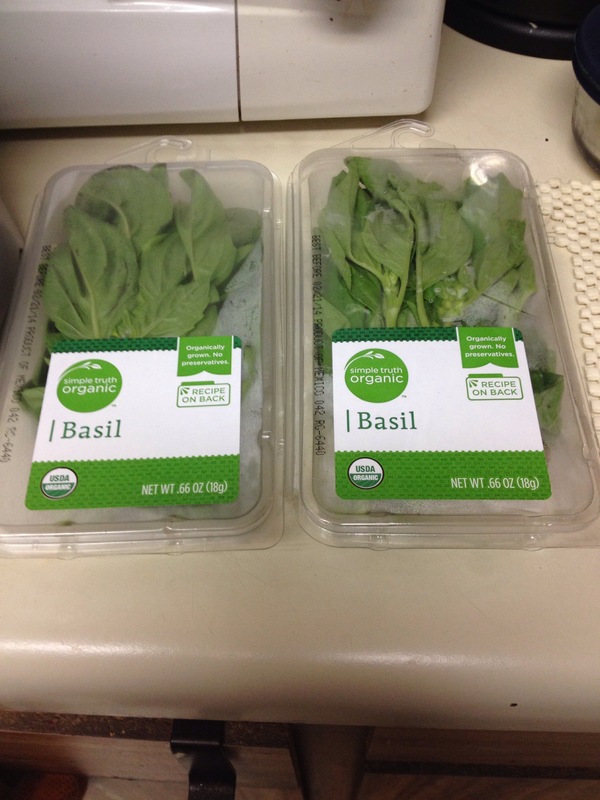 Oh, and the tomatoes had basil already in it, but of course I didn’t realize this point and bought basil anyway. More on that later. 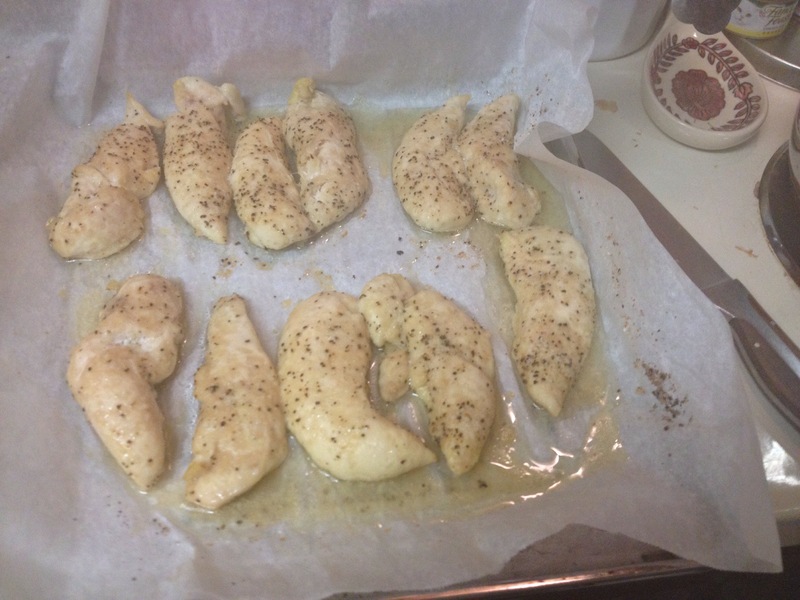 K’s packet of chicken tenders yielded 11 pieces, and the recipe calls for 4 chicken breasts. I guess it’s about the same. Rubbed them with some olive oil and sprinkled on some salt/pepper/garlic powder seasoning and roasted them in about 20 minutes or so. While that cooled, I was workin’ the stove. The recipe starts out with a LOT of chopped onion. If anyone I had called while I was doing this, they would have thought I was crying. I used up some golf-ball sized onions from the fridge that another neighbor gave me from his brother’s garden. Then I went to the soft-ball sized onions. That big food processor got USED today. So you cook the onions for about 15 minutes, then add the minced garlic. Then the huge pile of chopped bell peppers. You could eat these whole, couldn’t you? You know how when you are in your own kitchen alone, you can lick the beaters? Well, this is the same principle–when I work with big peppers like this one, I slice the tops off first to get the center and seeds out (like the one on the far left) and that sliced off top is MINE. Do NOT touch my tops. I have to make sure that the pepper tastes right, and darnit, it’s the cook;s privilege. So don’t mess with it. . .or else. Incidentally, that green cutting board with the hole in it is a new thing, and I got one right after Christmas when I was in The Woodlands. I think the pictures from that day have been lost (don’t ask) but I sure did enjoy using this cutting board and have tossed out a couple that were long overdue to be discarded. The Zeal Non-Slip Board To Pan Cutting Board is big, a little heavy, has some rubber along the bottom, and a hole in one corner. An unusual design from Britain, it allows you to cut to your heart’s content and then dump everything into a bowl, pot, or whatever. I thought it was a bit odd when I saw it, but it was on sale (of course) and I got one. I love this cutting board! Just don’t tip stuff the wrong way, and you’ll be fine, right? 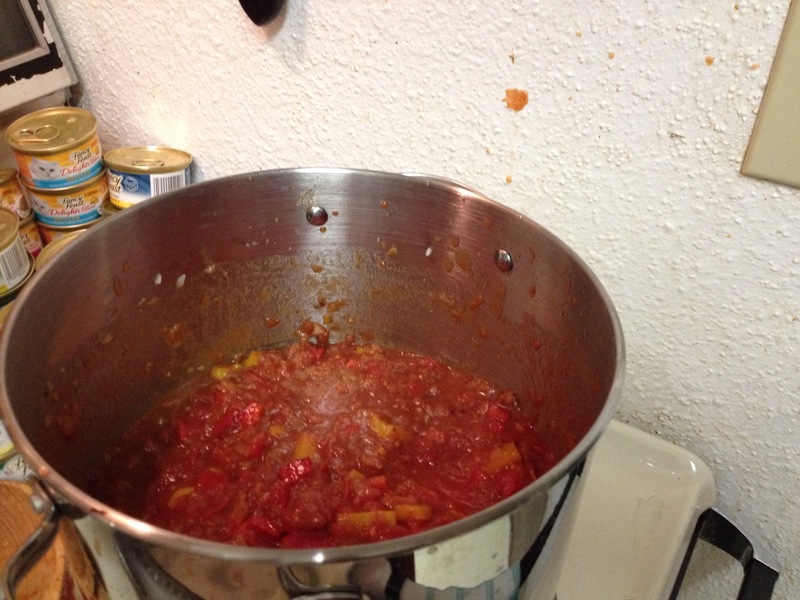 Then the two cans of tomatoes, buzzed through a food processor once or twice, and added to the pan to cook. 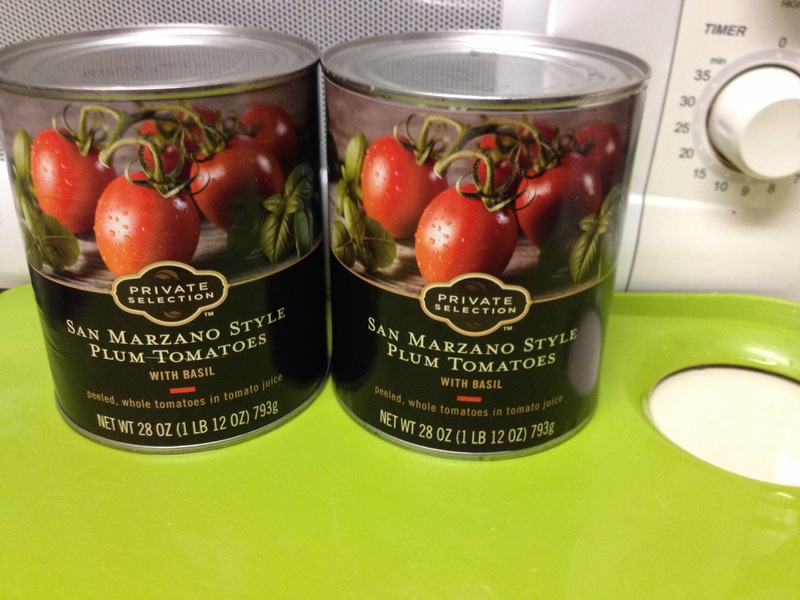 These were ten cents more than the regular canned tomatoes. Can you see the crime scene starting in my kitchen? Don’t worry, I wiped it up right after I took the picture. So you cook this tomato-laden pot for about 30 minutes, and the peppers, onions, tomatoes, garlic and basil melt together and get sweet. The chicken should be cool enough to handle by now (even if you used bone-in breast pieces), so it’s chopped into 3/4 inch pieces. This is what the tenders looked like after I chopped them. 4 breast pieces might yield a little more. 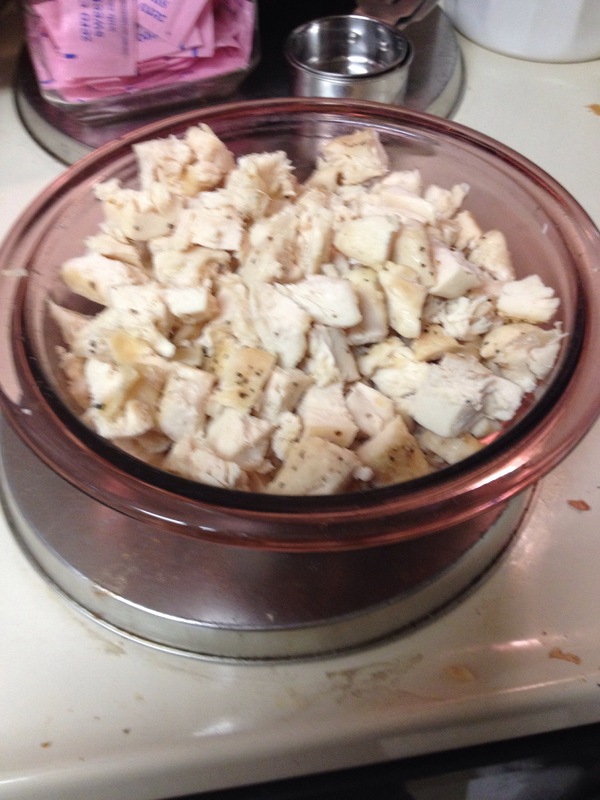 The chopped chicken is then dumped into the pot, and cooked for 20 more minutes. The original recipe makes 12 servings, but the one I linked to halves that recipe to 6 servings. But, go figure, it made seven servings, and now I can enjoy this delicious recipe until next Saturday. 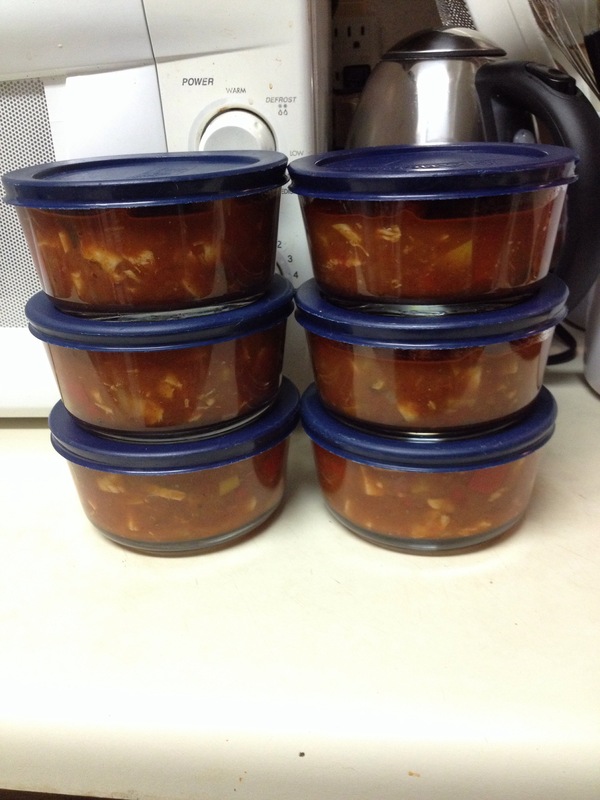 This recipe made seven big servings. Packed up the rest for the week. Now, I didn’t realize I didn’t need the basil, and it’s a too much trouble to bring it back to Kroger, so I did the next best thing. Fresh basil. Two for something, I think. Think I’ve got enough for pesto? Well, I made some. Had everything on hand, whizzed it up in the blender, and it’s packed and stashed in the freezer. If the cops ever investigate my freezer, they’ll be asking about all that pesto. 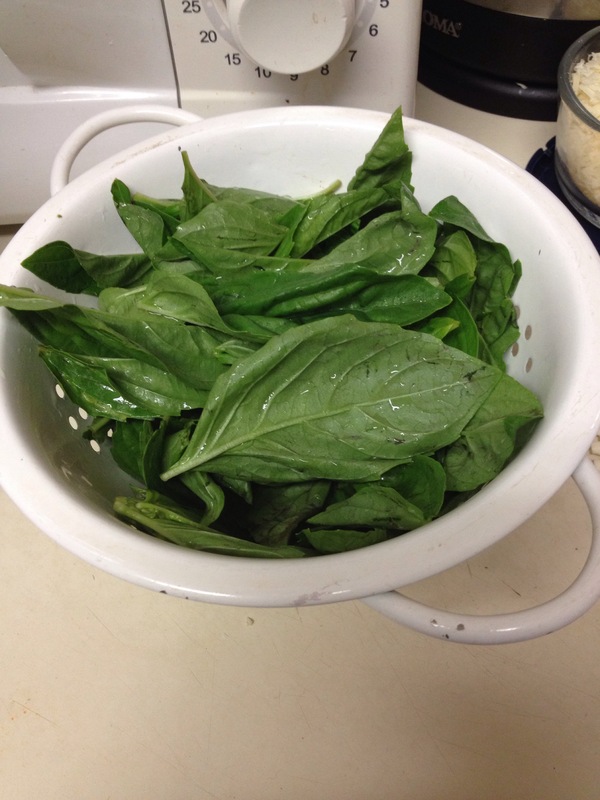 But–what could be wrong with pesto? I’m not losing any sleep over it. Long as I have peas in the freezer, I’ll be having Pea & Pesto Soup. A lot. The dishwasher is finished, the trash has been taken out, and I need to wrap it up soon. If you’re cold, stay warm. If you’re warm, stay cool. And have something good to eat. 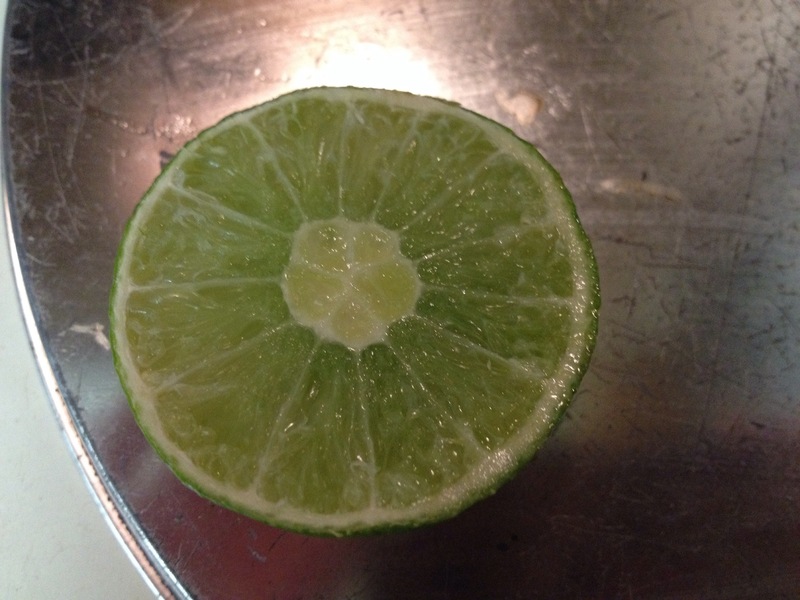 Posted by Amy on February 16, 2014 in Cookbooks, Gluten Free, Health & Wellness, Ingredients, What's for Dinner?